Diachronic map of pre-colonial African kingdoms. African empires is an umbrella term used in African studies to refer to a number of pre-colonial African kingdoms in Africa with multinational structures incorporating various populations and polities into a single entity, usually through conquest. Listed below are known African empires and their respective capital cities. The Sahelian kingdoms were a series of medieval empires centred on the sahel, the area of grasslands south of the Sahara. The first major state to rise in this region was the Ghana Empire (Wagadu). The name Ghana, often used by historians, was the regnal title given to the ruler of the Wagadu empire. Centered in what is today Senegal and Mauritania, it was the first to benefit from the introduction of gold mining. Ghana dominated the region between about 750 and 1078. Smaller states in the region at this time included Takrur to the west, the Malinke kingdom of Mali to the south, and the Songhai Empire centred on Gao to the east. When Ghana collapsed in the face of invasion from the Almoravids, a series of brief kingdoms followed, notably that of the Sosso (Susu); after 1235, the Mali Empire rose to dominate the region. Located on the Niger River to the west of Ghana in what is today Niger and Mali, it reached its peak in the 1350s, but had lost control of a number of vassal states by 1400. In 1810, the Sokoto Caliphate rose and conquered the Hausa, creating a more centralized state. It and Kanem-Bornu would continue to exist until the arrival of Europeans, when both states would fall and the region would be divided between France and Great Britain. From the 15th century until the final Scramble for Africa in the late 19th century a number of empires were also established south of the Sahel, especially in West Africa. The West African empires of this period peaked in power in the late 18th century, paralleling the peak of the Atlantic slave trade. These empires implemented a culture of permanent warfare in order to generate the required numbers of captives required to satisfy the demand for slaves by the European colonies. With the gradual abolition of slavery in the European colonial empires during the 19th century, slave trade again became less lucrative and the West African empires entered a period of decline, and mostly collapsed by the end of the 19th century. The Nok Civilization is considered to be one of the most advanced ancient sub-Saharan civilizations in African history. Beginning some time around 1500 BC, it was largely concentrated in what is now Nigeria but produced some of the first sub-Saharan iron smelting and terracotta architecture. Mysteriously died out around 200 AD. The Kingdom of Nri (1043–1911) was the West African medieval state of the Nri-Igbo, a subgroup of the Igbo people, and is the oldest kingdom in Nigeria. The Kingdom of Nri was unusual in the history of world government in that its leader exercised no military power over his subjects. The kingdom existed as a sphere of religious and political influence over much of Igboland, and was administered by a priest-king called the eze Nri. The eze Nri managed trade and diplomacy on behalf of the Igbo people, and was the possessor of divine authority in religious matters. The Oyo Empire (1400–1895) was a West African empire of what is today western Nigeria. The empire was established by the Yoruba in the 15th century and grew to become one of the largest West African states. It rose to prominence through wealth gained from trade and its possession of a powerful cavalry. The Oyo Empire was the most politically important state in the region from the mid-17th to the late 18th century, holding sway not only over other Yoruba states, but also over the Fon kingdom of Dahomey (located in the state now known as the Republic of Benin). Benin Empire (1440–1897), a pre-colonial African state of modern Nigeria. Kaabu Empire (1537–1867), a Mandinka Kingdom of Senegambia (centered on modern northeastern Guinea-Bissau but extending into Casamance, Senegal) that rose to prominence in the region thanks to its origins as a former province of the Mali Empire. 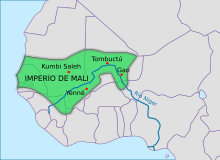 After the decline of the Mali Empire, Kaabu became an independent kingdom. Aro Confederacy (1690–1902), a trading union orchestrated by the Igbo subgroup, the Aro people, centered in Arochukwu in present-day Southeastern Nigeria. Bonoman (11th century–19th century), earliest known Akan state. Gold trading and Kola nut trading with Northern Neighbors brought wealth and prosperity to Akan creators of this state. Culture influenced much of modern Akan culture. Ashanti Empire (1701–1894), a pre-colonial Akan West African state of what is now the Ashanti Region in Ghana. The empire stretched from central Ghana to present day Togo and Côte d'Ivoire, bordered by the Dagomba kingdom to the north and Dahomey to the east. Today, the Ashanti monarchy continues as one of the constitutionally protected, sub-national traditional states within the Republic of Ghana. Kong Empire (1710–1898) centered in north eastern Côte d'Ivoire that also encompassed much of present-day Burkina Faso. Bamana Empire (1712–1896) based at Ségou, now in Mali. It was ruled by the Kulubali or Coulibaly dynasty established c. 1640 by Fa Sine also known as Biton-si-u. The empire existed as a centralized state from 1712 to the 1861 invasion of Toucouleur conqueror El Hadj Umar Tall. Sokoto Caliphate (1804–1903), an Islamic empire in Nigeria, led by the Sultan of Sokoto, Sa’adu Abubakar. Founded during the Fulani Jihad in the early 19th century, it was one of the most powerful empires in sub-Saharan Africa prior to European conquest and colonization. The caliphate remained extant through the colonial period and afterwards, though with reduced power. Wassoulou Empire (1878–1898), a short-lived empire built from the conquests of Dyula ruler Samori Ture and destroyed by the French colonial army. An Empire of Kitara in the area of the African Great Lakes has long been treated as a historical entity, but is now mostly considered an unhistorical narrative created as a response to the dawn of rule under the Lwo empire. The latter is the sole historical record of an organized Nilotic migration into the area. The Kongo Kingdom (1400–1888) was a quasi-imperial state as is evident by the number of people and kingdoms that paid it tribute. If not for the large amount of text written by the EssiKongo that repeatedly called themselves a kingdom, they would be listed as the "Kongo Empire". The Luba Empire (1585–1885) arose in the marshy grasslands of the Upemba Depression in what is now southern Democratic Republic of Congo. Lunda Empire (1660–1887) in what is now the Democratic Republic of Congo, north-eastern Angola and northwestern Zambia. Its central state was in Katanga. The Mutapa Empire or Empire of Great Zimbabwe (1450–1629) was a medieval kingdom located between the Zambezi and Limpopo rivers of Southern Africa in the modern states of Zimbabwe and Mozambique. Remnants of the historical capital are found in the ruins of Great Zimbabwe. Maravi Empire or Marawi or Merowi or Merowe/ Meroe Empire. Not to be confused with Ancient Meroe. 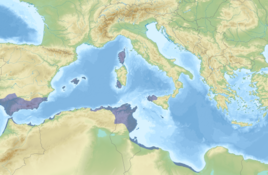 Ancient Carthage and its dependencies in 264 BC. The Sennar Sultanate (1502–1821) was a sultanate in the north of Sudan. It was named Funj after the ethnic group of its dynasty or Sinnar (or Sennar) after its capital, which ruled a substantial area of the Sudan region. Domains of the Aksumite Empire and the later Adal Sultanate. Ancient Barbara/Barbaroi cities and states mentioned in the Periplus of the Erythraean Sea (1st century). Regal kingdoms: Kingdoms where the king controls the external affairs directly, and the internal affairs via a system of overseers. The king and his chiefs belong to the same clans or lineages. Incorporative kingdoms: Kingdoms where the king only controls only the external affairs with no permanent administrative links between him and the chiefs of the provinces. The hereditary chiefdoms of the provinces were left undisturbed after conquest. Examples are the Bamileke, Lunda, Luba, Lozi. Federations: Kingdoms (such as the Ashanti Union) where the external affairs are regulated by a council of elders headed by the king, who is simply primus inter pares. Hunwick, John O. (2003). Timbuktu and the Songhay Empire: Al-Saʻdī's Taʼrīkh al-sūdān Down to 1613 and other Contemporary Documents. Leiden: Brill Academic Publishers. pp. 488 Pages. ISBN 90-04-12822-0. J. Vansina, A Comparison of African Kingdoms, Africa: Journal of the International African Institute (1962), pp. 324–335. ^ Ehret, Christopher (2002). The Civilizations of Africa: A History to 1800. ISBN 081392085X. ^ Bortolot, Alexander Ives (May 2009). "The Transatlantic Slave Trade". Metropolitan Museum of Art. Retrieved 13 January 2010. ^ Chrétien, Jean-Pierre; Scott Strauss (October 2006). The Great Lakes of Africa: Two Thousand Years of History. MIT Press. Gates, Henry Louis & Kwame Anthony Appiah (1999). Africana: The Encyclopedia of the African and African American Experience. New York City: Basic Civitas Books. pp. 2095 Pages. ISBN 0-465-00071-1. Hempstone, Smith (2007). Africa, Angry Young Giant. Whitefish: Kessinger Publishing, LLC. pp. 664 pages. ISBN 0-548-44300-9. Mwakikagile, Godfrey (2000). Africa and the West. Hauppauge: Nova Publishers. pp. 243 Pages. ISBN 1-56072-840-X. Oliver, Roland & Anthony Atmore (2001). 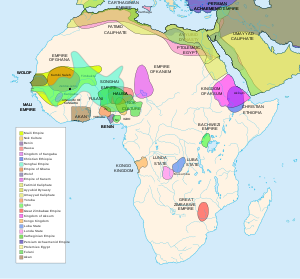 Medieval Africa 1250-1800. Cambridge: Cambridge University Press. pp. 251 Pages. ISBN 0-521-79372-6. Shillington, Kevin (2005). Encyclopedia of African History Volume 1 A-G. New York: Routledge. pp. 1912 pages. ISBN 1-57958-245-1.